Strike action by UK Border Agency workers on Wednesday could lead to delays of 12 hours at Heathrow Airport, passengers have been warned. While travel insurance can help cover the costs that any such action should cause, the warning of "gridlock" at the airport could leave many holidaymakers and businessmen alike frustrated. The airport's chief operating officer, Norman Boivin, said the delays at immigration checkpoints are likely to be so long that passengers could not be safely accommodated within the terminals, warning that they may need to be held on arriving aircraft. 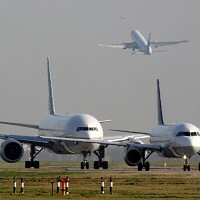 That in turn could lead to the cancellation of flights, forcing people to check whether their travel insurance policy can help out as they make alternative arrangements or end up landing at another airport. Heathrow operator BAA has been holding talks with airlines and the Border Agency to try to minimise the impact of the public sector strike at the airport, which handles more international passengers than any other.